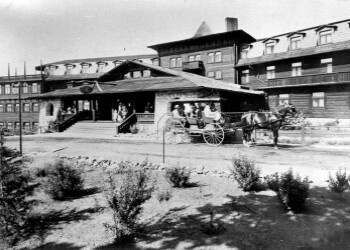 El Tovar Hotel, the premier lodging facility at the Grand Canyon, opened its doors in 1905 and was most recently renovated in 2005. In the past, the Hotel has hosted such luminaries as Theodore Roosevelt, Albert Einstein, Western author Zane Grey, and many others. Today, El Tovar retains its elegant charm. Located on the Canyon rim, it features a fine dining room (open for breakfast, lunch, and dinner), lounge and curio shop with newsstand. El Tovar offers its guests Concierge, turn-down and room service and is a Registered National Historic Landmark. El Tovar Hotel has 78 rooms and suites, all with cable television, telephone, full bath and air conditioning. Standard rooms have one double, one queen, or two queen beds. Deluxe rooms have either two queens or one king bed. Suites have a bedroom with either two queens or one king bed, and a sitting room, and some of the suites have a porch or balcony. All rooms are non-smoking. Some rooms and suites will accommodate a rollaway bed, which would be subject to availability and cannot be reserved. El Tovar has free, self-parking. Room service is available during limited hours. Lodging at El Tovar may be booked well in advance but cancellations do occur. Visit during the winter months for best availability. Grand Canyon National Park is located in Northern Arizona. 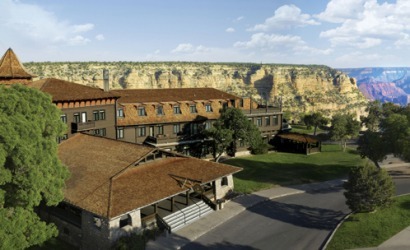 Grand Canyon Village (South Rim) is located 60 miles North of Interstate 40 at Williams via Highway 64, and 80 miles Northwest of Flagstaff via Highway 180. Only ten miles from rim to rim as the crow flies, the North Rim is 215 miles (about 4 1/2 hours) from the South Rim by car. Please watch for animals and drive carefully. Please note that gasoline is only available inside of the park seasonally at Desert View. Gasoline is available year-round, just outside of the park to the South in Tusayan. Today the canyon is one of the world's most amazing natural wonders, where people come from all over the world to marvel at its beauty and mystery. The Grand Canyon is 277 miles (446 km) long, between 4 - 18 miles (6.4 - 29 km) wide and over a mile deep (1.6 km), which makes it the largest canyon on land. Erosion is still occurring and will continue to do so, but at a much slower rate than in the past. This is mostly due to the Glen Canyon Dam. The dam is harnessing the hydroelectric power of the Colorado River, controlling how much water is put in the river and filtering out much of the sediments that erode before it hits the canyon. The Grand Canyon National Park is a place of wonder and beginning, where learning about our geologic past is being used to ensure a better future.